Caramel Apple Wassail is perfect for those times when you want to get together to watch the big game. Another time that we love to drink caramel apple wassail is when you just need warming up. Some nights this time of the year can be a little chilly. 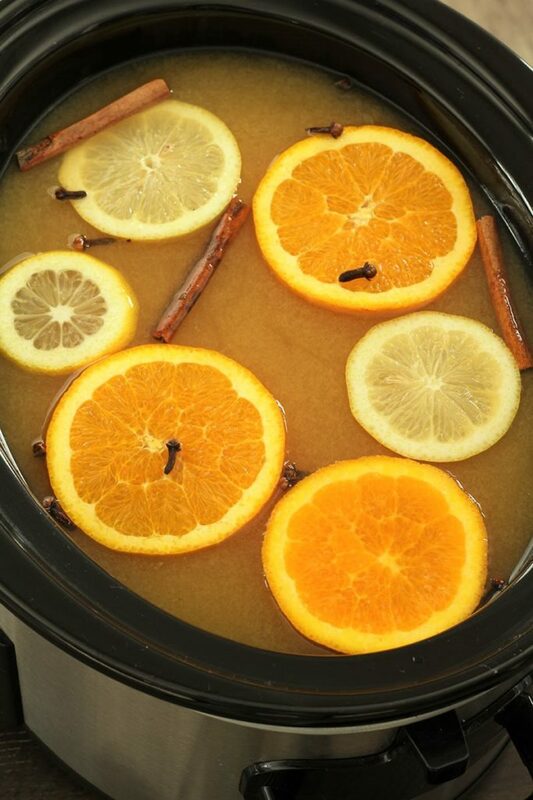 So grab your crock pot, some apple juice, orange juice, lemon juice, caramel topping, a few spices, and some Sprite®. We decided to have a party and watch one of the football games. Sometimes when we get together some of us like one team and some of us like the other team. But we always agree that we have to have good food and drinks at our get-togethers! Sometimes I wonder if we get together more for the food than to watch the games. Pizza is always a favorite at our get-togethers and we love Member’s Mark 16″ Take ‘N Bake Pepperoni Pizza from Sam’s Club. It is so convenient to be able to have the pizza ready in 15 minutes! And it is so much less expensive than delivery. Sam’s Club has so many convenient locations. We have been Sam’s Club members for many years, and each time that we have moved, our membership has moved with us. And we have always found a convenient Sam’s Club location in our new area. Sam’s Club is convenient to get in and out of, and we love shopping there. We have found that they have very competitive prices and good, quality merchandise. We buy a lot of our groceries at Sam’s Club. The Member’s Mark 16″ Take ‘N Bake Pepperoni Pizza is made fresh daily with premium ingredients​, not frozen pizzas. 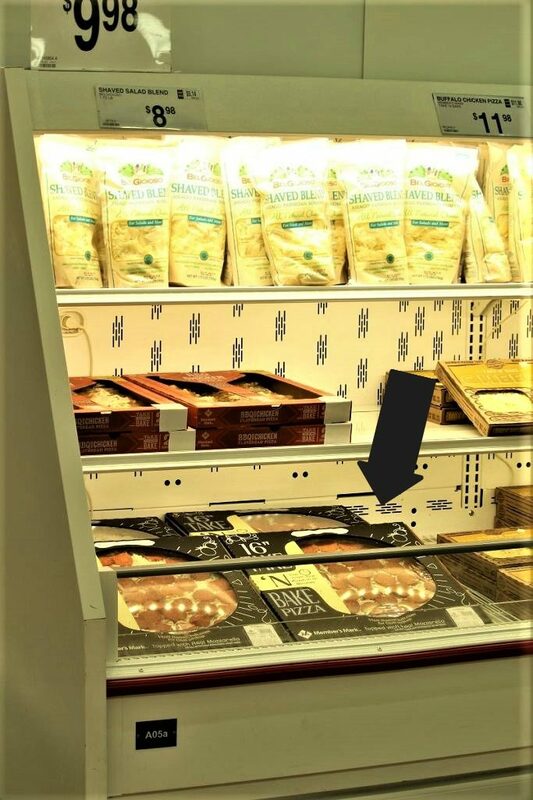 They have an artisan-style crust, tomato sauce made with 100% non-GMO tomatoes, and 100% real-whole milk cheese. And best of all, they are delicious! And of course, no get-together is complete without drinks. There was a chill in the air today, so we decided to pair our pizza with one of our favorite chilly weather drinks. I made up a batch of caramel apple wassail with Sprite®. I started the caramel apple wassail 2 hours before the game. You can put the caramel apple wassail together in about 10 minutes or less. Just put your apple juice, orange juice concentrate, lemon juice, cloves, cinnamon, nutmeg, and caramel sauce into a large crock pot. Stir the ingredients to combine and let the mixture cook on low for 2 – 3 hours. Note that the Sprite® is added later to each individual serving as desired. I will let you in on a little secret, I do like to cook, but sometimes you just need a break. It is fun to get together with friends and family, but it is nice to sit and relax with everyone instead of being in the kitchen cooking the whole time. Let’s be honest, you clean the house, go buy the food and by the time everyone shows up, you are ready for a nap. I use to get a lot more done, but now that I am a little older, or a little, lets call it seasoned, I do not get things done as fast as I use to! 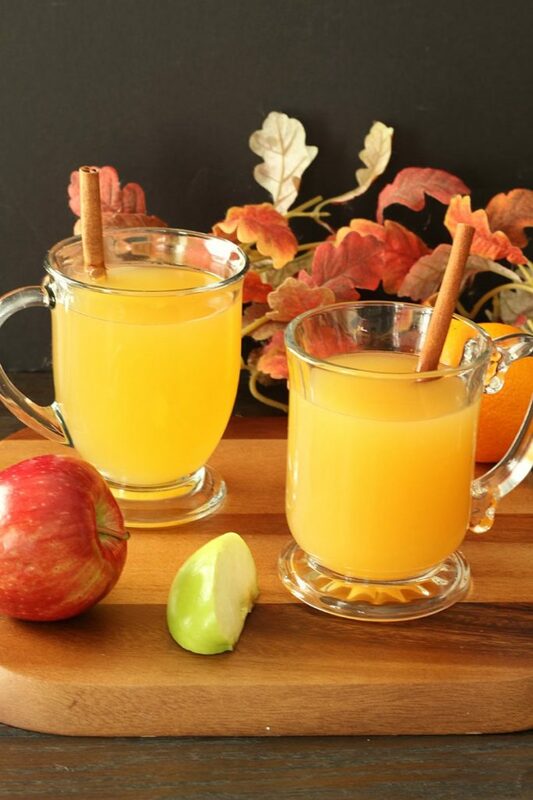 I must say that caramel apple wassail is one of those drinks that you could drink on a special occasion, just for fun, or just because you are in the mood. 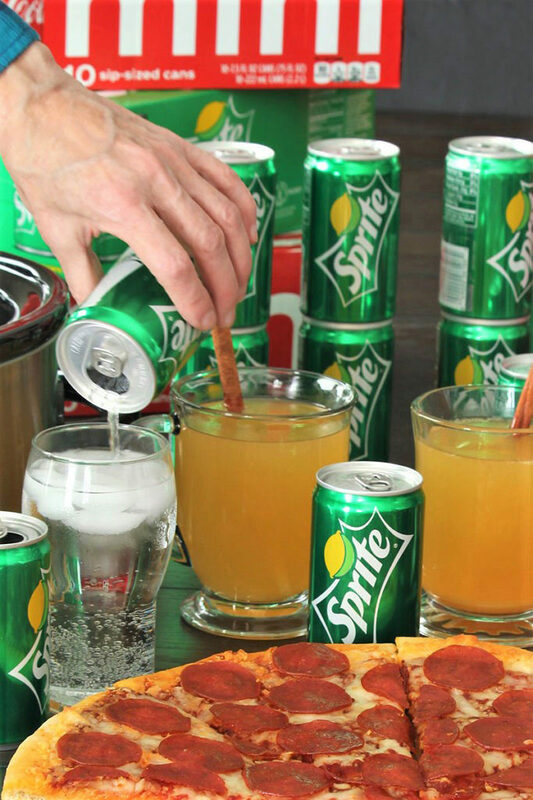 It is fun to take a 7.5 ounce mini Sprite® and pour it in the caramel apple wassail. This is a genius idea because the wassail usually gets too hot for most people, so if you fill your mug half way full of wassail and then add Sprite® to fill it up, the drink turns out perfect for everybody. The Sprite® also adds a bit of a fizz to the drink. We used to put ice cubes in our wassail to cool it down enough to drink it, but that watered down the taste. Adding Sprite® is so much better and everybody can make their wassail the temperature that they want to without it being watered down! We also had our refrigerator stocked with chilled Sprite® minis and Coca-Cola® minis with plenty of ice on hand, just in case some of the guests wanted a cold drink. Sometimes cheering while watching a game gets some of us heated up! Just keep your refrigerator stocked with Coca-Cola® so you don’t ever run out. 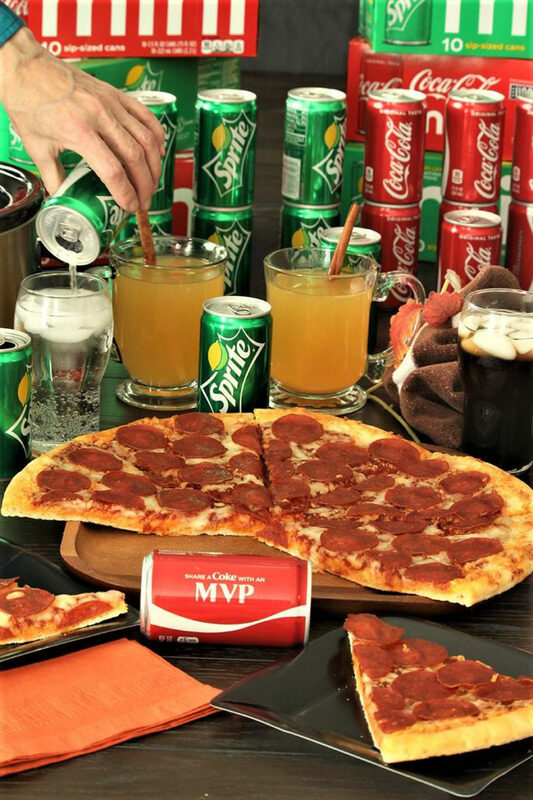 It is always nice to have some of that classic, delicious Coca-Cola® ready to share with family and friends. It may bring back some pleasant memories from days gone by and it will for sure make some new memories. 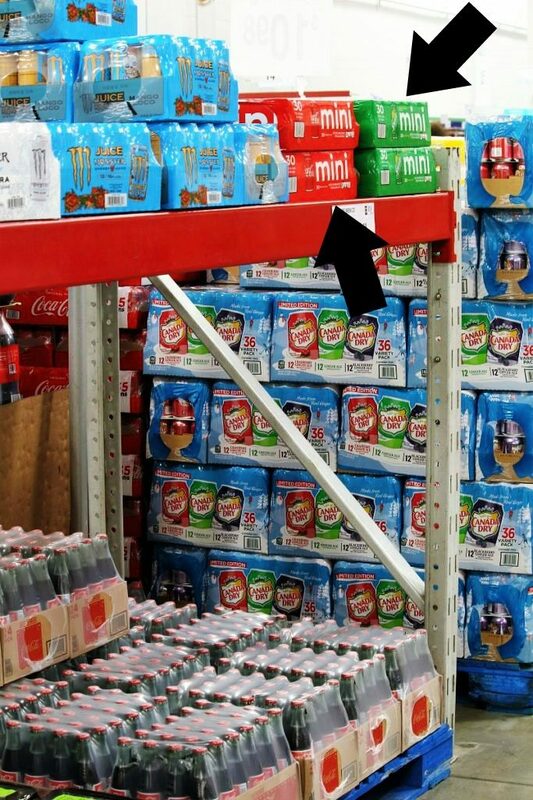 It seems that there are always a few die hard Coca-Cola® fans in attendance at any gathering! We always keep our refrigerator stocked with Sprite® too. There is nothing like a cold Sprite® to quench a thirst with it’s crisp, clean, taste. Sprite® has 100% natural flavors. 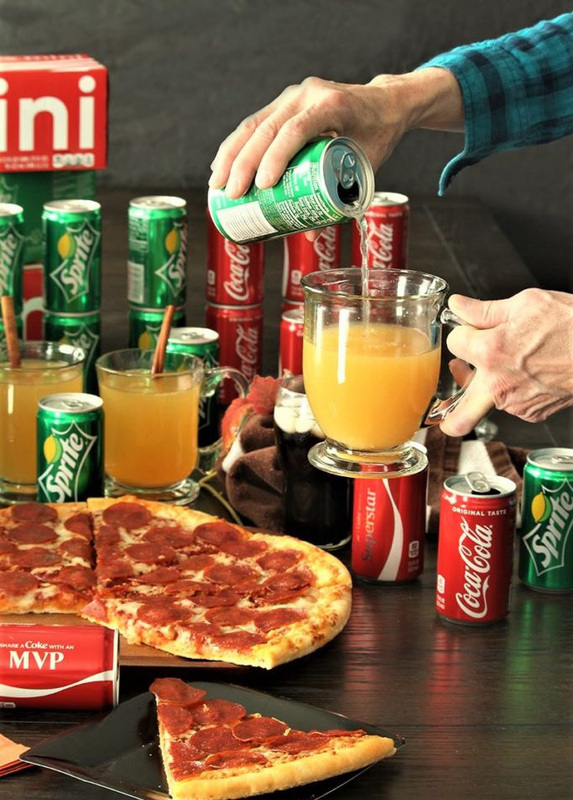 Do you know how popular these 7.5 ounce mini cans of Sprite® and Coca-Cola® are? People love them. 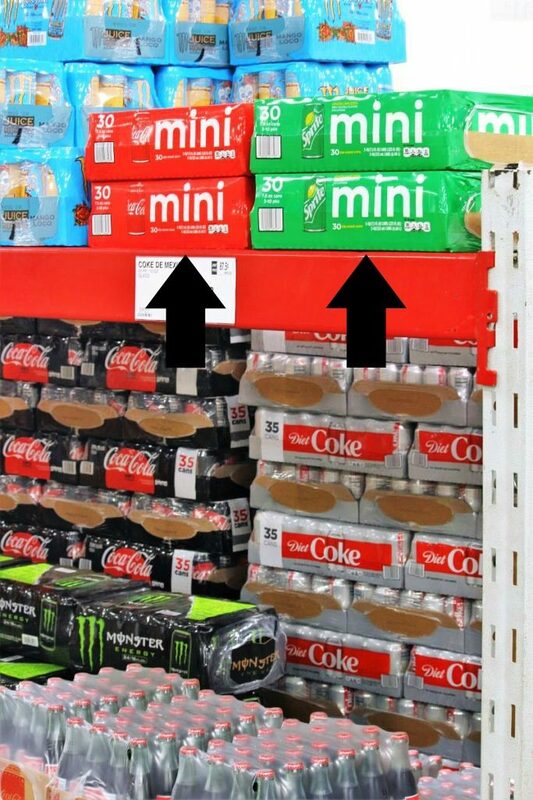 So when I went to take a picture at Sam’s Club so that you will know where to find the 7.5 ounce mini cans of Sprite® and Coca-Cola®, there was a lady that came by and she wanted some, and then another lady came by and got some before the first lady got hers. So I asked the lady if she didn’t mind waiting until I took the picture so that there would be a couple of packs in my picture! She was very sweet and waited for me to snap the picture, and here it is. These cans are just perfect for get-togethers, and for using in the caramel apple wassail. I love the size of the cans and they are just plain cute. 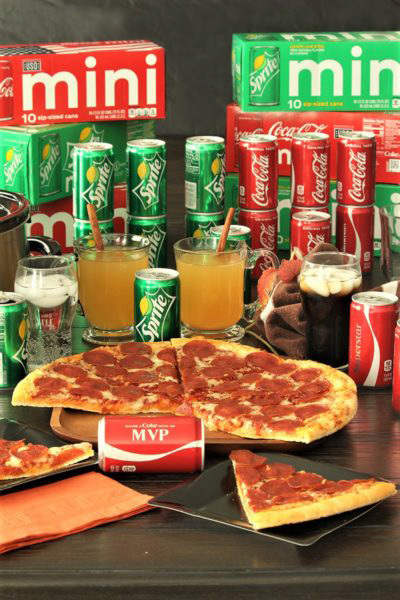 The party was a great success, and as you can see, people were enjoying their caramel apple wassail, Sprite®, Coca-Cola® and Member’s Mark 16″ Take ‘N Bake Pepperoni Pizza. 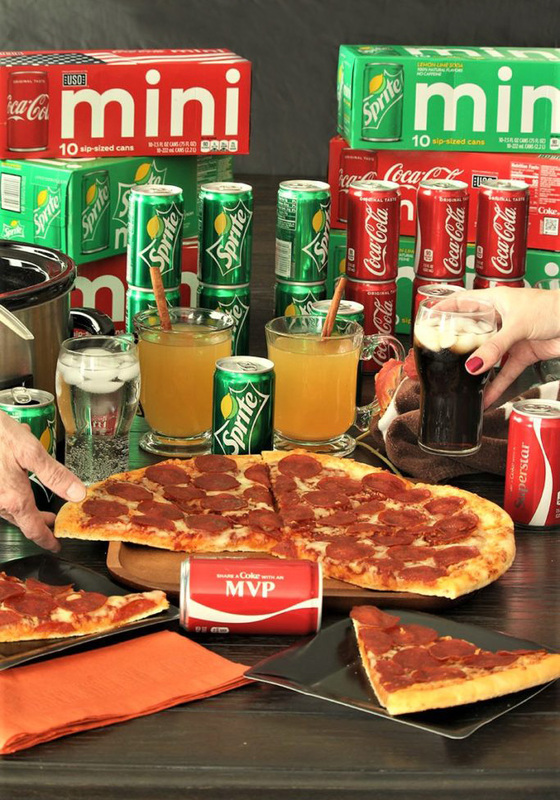 Next time that you are getting together for a fun game or for any get-together, try some caramel apple wassail, Sprite® 7.5 ounce mini cans, Coca-Cola® 7.5 ounce mini cans, and the Member’s Mark 16″ Take ‘N Bake Pepperoni Pizza. The pizza is fantastic! This time of year goes way too fast, and with the holidays just around the corner, take some time to sit back and enjoy those loved ones. 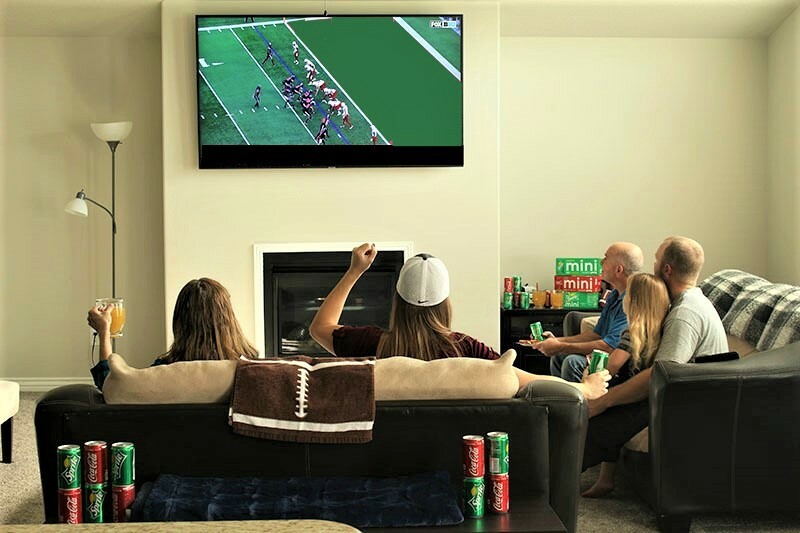 Remember, it isn’t all about mom or dad spending four or five hours in the kitchen making food before the game; it is about everyone having a good time. 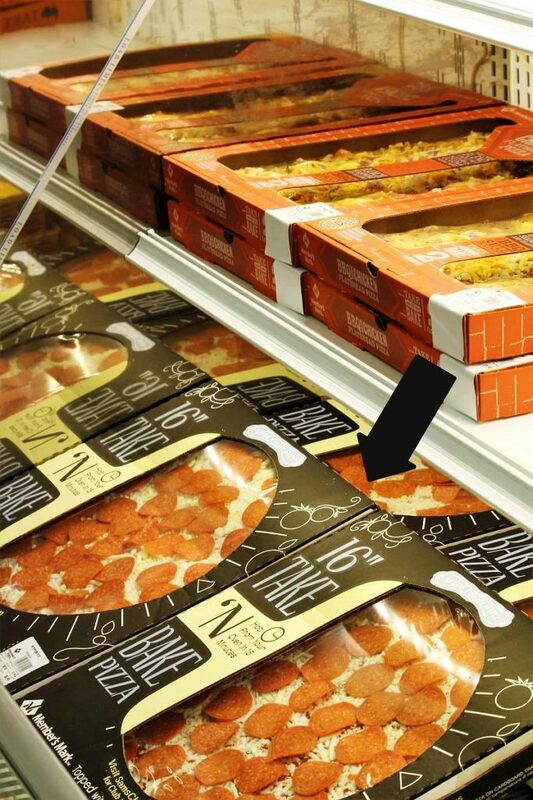 Another thing is that if you can get a Member’s Mark 16″ Take ‘N Bake​ pizza, do it (We love Pepperoni, but the Member’s Mark 16″ Take ‘N Bake Cheese Pizza is also very good, especially for the kids). That way you won’t be so tired and you will be in a much better mood, no matter who wins the game. Now if you aren’t watching the game, take time out to enjoy those little ones, they do grow up. I know that when I was a young mom, I felt that my kids would never grow up and that I would never get any time to myself. Now, they are all grown up and some days you wonder what you are going to do with yourself? So, here is a great idea! Figure out when the next game is that you want to watch. 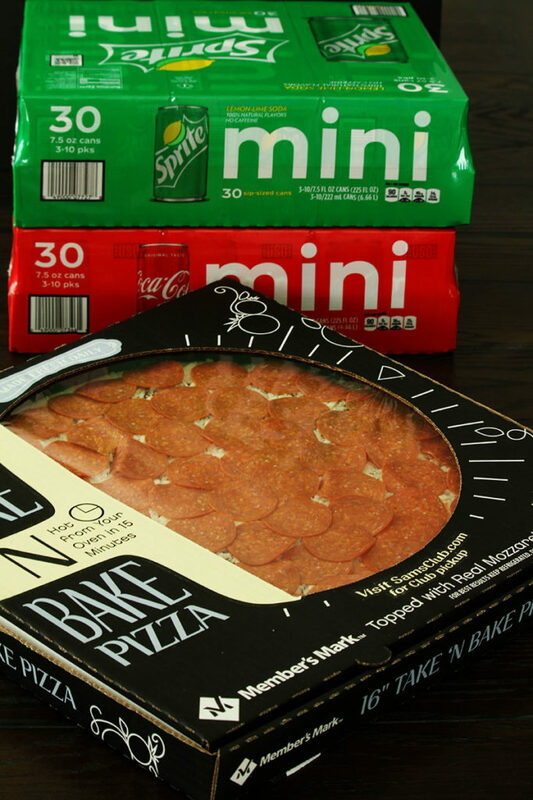 Go to Sam’s Club and buy some cans of mini Sprite®, some cans of mini Coca-Cola® and a Member’s Mark 16″ Take ‘N Bake Pepperoni Pizza or two. While you are at Sam’s Club, pick up any of the ingredients that you need for the caramel apple wassail recipe too. Invite a few friends over, slow down and enjoy life. We are just a little too busy in our everyday lives. I know that you will be glad that you made time for friends and family. I like that a whole lot better than a big can. We did drink all of the caramel apple wassail and so now it is time to make some more. 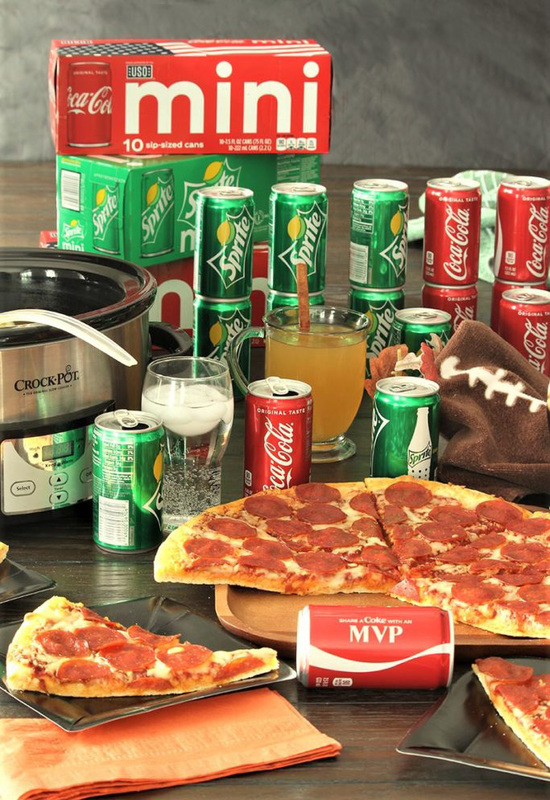 Enjoy your game day and we hope that you have gotten some great ideas for a get-together. Now just go and do it. You could also use 6 fresh squeezed oranges in place of the frozen concentrate. You can use 4 fresh squeezed lemons in place of your 1/4 cup lemon juice. If you are not big on nutmeg, you can leave it out, but it isn’t that strong of taste. You can also add 1/8 teaspoon of ginger. Use a large crock pot because 1 gallon equals 16 cups. 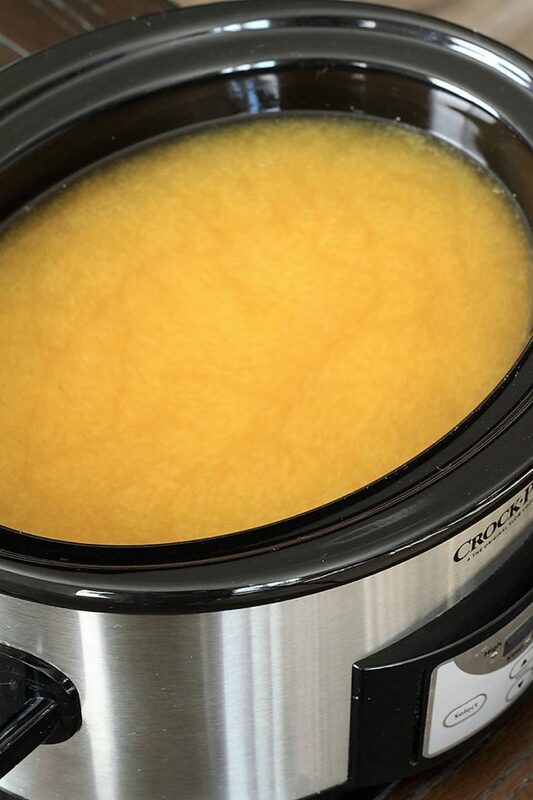 If you do not have a large crock pot, you can use a stock pot and simmer it on the stove for 1 hour, a crock pot is just easier. Place all the ingredients into a large crock pot, except the sprite. Turn the crock pot on low for 2 - 3 hours. We use cups that hold 1 cup of liquid. With a ladle, fill the cup ½ full. Using the 7.5 ounce cans of Sprite, fill the cup the rest of the way. This is so yummy and the sprite makes the wassail so that it isn't so hot. The wassail looks delicious. What a great combinations of flavors. Pinning. Thanks for sharing at Snickerdoodle. Thank you, it is really delicious. I could use some right now as it has really turned off chilly here. Thank you for pinning. What an inventive way to use Sprite!! Perfect for the holiday season! It really is great in the wassail! And I am looking forward to serving for Christmas Eve. Aren’t you so excited for the holidays?